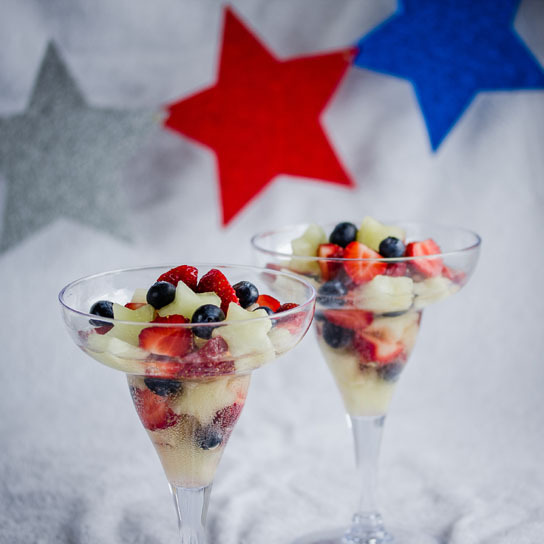 Red, White and Blue Dessert for Celebrating 4th of July - Low-Carb, So Simple! -- gluten-free, sugar-free recipes with 5 ingredients or less | Low-Carb, So Simple! This simple yet festive dessert is especially for my American readers (and you are many!) or for anybody celebrating 4th of July. Even if you don’t celebrate American Independence Day, this colorful dessert is perfect for finishing any summer day meal. Moreover, this delectable dessert is healthy, so you have a double delight serving it for your loved ones! Flavorful fresh berries, full of vitamins and flavonoids yet little carbs, are perfect for healthy and indulgent low-carb diet. For this dessert you don’t have to heat your oven which makes it perfect for a hot summer day. And because this fruity dessert is light, sparkling and refreshing, you’ll always have a little bit of space in your tummy for this treat, even after a hefty main course. If you don’t consume alcohol at all, or if you would like to make this dessert for the whole family, I’ll give some suggestions in the end of the post for replacing the sparkling wine. Start preparing of this dessert from the star-shaped melon pieces. Here is how I handle the melon. Please feel free to use a different method if you are more comfortable with that. First I cut the melon in half and scoop the seeds out with a spoon. After that I cut the melon into 0.4 inch (1 cm) wide slices. Using a big and sharp knife, I remove the skin from each melon slice. …until all the melon slices are handled. I got 60 stars from one honeydew melon when I used a cutter which was 1.5 inches (3.1 cm) in diameter. Well, 50 stars would have been more appropriate… You can prepare the melon stars beforehand and store them covered and refrigerated. Put the dessert together just before serving. Because this dessert is a festive one, be sure to pick the freshest and the most beautiful berries and melon stars for this one. You can sweeten the dessert with vanilla stevia, especially if you prefer sweet flavors but not carbs. Personally, with this dessert I prefer alcohol-free sparkling wine without extra sweetening. Fresh berries are now in season and 4th of July is near. Perfect reasons to develop a festive and healthy dessert for celebrating! I had so many ideas that I couldn’t get sleep on one night. Actually, it was bloody hot weather. Again. Too hot for my arctic brain and body. I guess that was the main reason I couldn’t get sleep. I just kept ideas flowing and wrote down so many I could. Most of them I forgot. What a pity. My original idea was to develop some finger food for 4th of July festivities. I was planning to serve something on cocktail sticks. I did some experiments with star-shaped pieces of apples. I let the pieces marinate in red wine overnight so that the stars turned beautifully red and got elegant flavor from the red wine. Then blue cheese for blue and white colors. Very tasty, but somehow I wasn’t satisfied. I kept ideas flowing. I was thinking of different low-carb fruits and berries. I was obsessed with the idea of star-shaped pieces of fruits. How about cutting out stars from honeydew melon and letting the melon marinate in dry white wine overnight? Adding a few drops vanilla stevia would bring sweetness and some pleasant vanilla flavor. That would be the white color. Then strawberry for red and blueberry for blue. All served on cocktail stick. Again simple, tasty and beautiful, but I still wasn’t satisfied. I think I simply wanted something more festive. Then it suddenly hit me. Why would I marinate the star-shaped melon pieces in white wine and then have no use for the precious white wine after that? I simply could serve the berries and melons in serving glasses or cocktail glasses and fill the glasses with white wine! In the end, because this dessert is supposed to be a very festive one, I changed the white wine for sparkling wine. Actually, this week was so busy — involving some long-distance driving, an asthmatic cat, a wild child and broken fridge — that I’m relieved I managed to develop a recipe, even this simple one. I really hope you like it! Slice the melon into 0.4 inch (1 cm) wide slices. Remove the skin from the melon slices. Clean and hull the strawberries. Cut small strawberries into 2 pieces and large ones into 4 pieces. Set aside. Clean the blueberries, if needed. Arrange the melon stars, strawberry pieces and blueberries in 4 serving glasses or cocktail glasses. In case you would like to sweeten the dessert, drop 4 drops vanilla stevia into each serving glass. Pour sparkling wine gently over each serving. If you have added vanilla stevia, you can gently stir the dessert so that the stevia gets well mixed. For alcohol-free version, you can simply replace the sparkling wine with alcohol-free sparkling wine. Another option is to replace the wine with 1 cup (240 ml) sparkling water, 1 tablespoon freshly squeezed lemon or lime juice and 20 drops vanilla stevia. This version is great for kids. 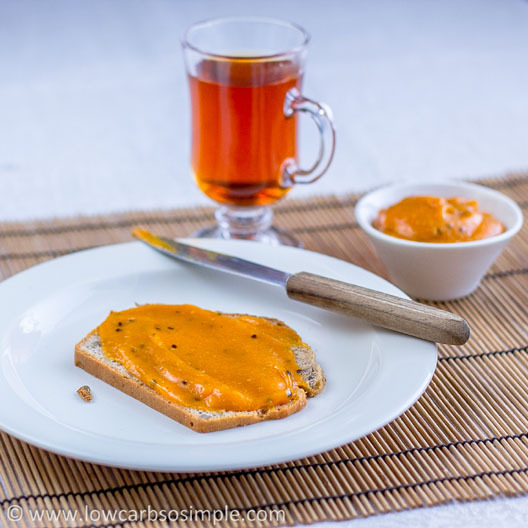 Nothing prevents from trying orange juice instead of lemon or lime juice. You can top each serving with a good dollop of whipped cream. For extra indulgence, you can add seeds from one vanilla bean to the cream before whipping. Sweeten the cream with liquid stevia before whipping, if needed. I love this dessert with whipped cream! In case you don’t care for fluid with your dessert, serve the melon stars, strawberry pieces and blueberries with just plain full-fat yogurt, or top the fruits and berries with whipped cream. In case you are not into star shapes, please feel free to use your imagination and cut out some other shapes from the honeydew melon. Hearts, clubs, spades, diamonds, drops, half moons, letters, numbers… Different shapes for different occasions! And, in case the color doesn’t have to be white, you can use cantaloupe or watermelon instead. After cutting out those star shapes there is a lot honeydew melon left. Don’t waste it. Blend the leftover melon smooth with 2 tablespoons freshly squeezed lemon juice and 25 drops vanilla stevia. Pour into a freezer-safe container, cover and freeze. Check every hour and mix thoroughly. If you prefer slushy consistency, the sorbet is ready after an hour or two. If you prefer harder ice, it takes a couple of hours more. Enjoy! Lovely dessert. Beautiful pictures. Thank you for the delightful dessert idea. Thanks, Linda, for your nice comment!